Happy St. Patrick’s day! Do I care about it? Not really. Long gone are the college days of waking up early to drink chemical and gluten laden green beer and eat complimentary bowls of lucky charms. Annnnd who am I kidding? I never woke up early back then anyways. Most St. Patrick’s days that I can remember I didn’t roll out of bed until after noon – then I showered, popped on my “mini hat” (a St. Patrick’s day tradition within my group of friends from college) and went to the bar, where I drank vodka and red bull. Yeah, I’m not Irish! Nowadays with a toddler, St. Patrick’s day is just another day. This St. Patrick’s day (today), I happened to wake up with a batch of my homemade chicken broth cooking in the crock pot (learn how here) after making my convection roast chicken last night. 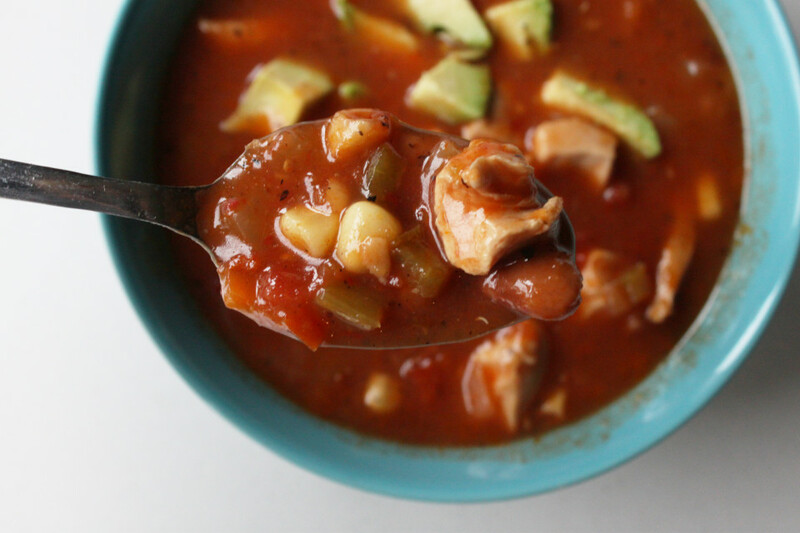 This afternoon I plan on making the following Southwest chicken soup because I bought way too many avocados at the grocery store a few days ago. This is similar to many chicken tortilla soup recipes but I named it Southwest Chicken soup because I have the hopes of someday coming up with a recipe that’s similar to the AMAZING chicken tortilla soup I used to get from the Chicago Tribune’s cafe – seriously – it was delicious (ask any old employees). 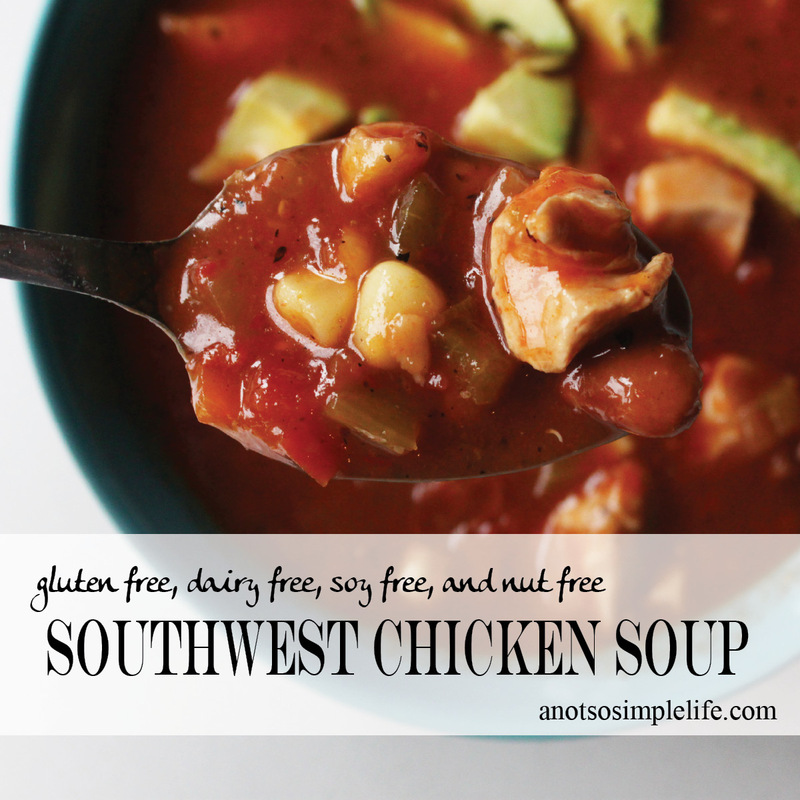 Just like all of my recipes, this is gluten free, dairy free, soy free, and nut free. My husband tops his with some cheese (and I would imagine it’s delicious). My favorite thing about this recipe is that I usually, without planning, have all of the ingredients on hand (like I do right now). In your soup pot, bring your broth to a hard boil. If your chicken is raw, drop chicken pieces into the boiling broth and cook for 10 minutes (or until cooked through). While the chicken is cooking, combine 15oz can of roasted tomatoes (I usually reserve 3 or 4 tomatoes to chop and keep chunky), can of green chilies, chipotle pepper, 1 tsp of adobo sauce, garlic clove, 1/4 of your chopped red pepper, 3 tbsp tomato paste and 1 tbsp of honey in your blender. Puree until it resembles a tomato sauce. 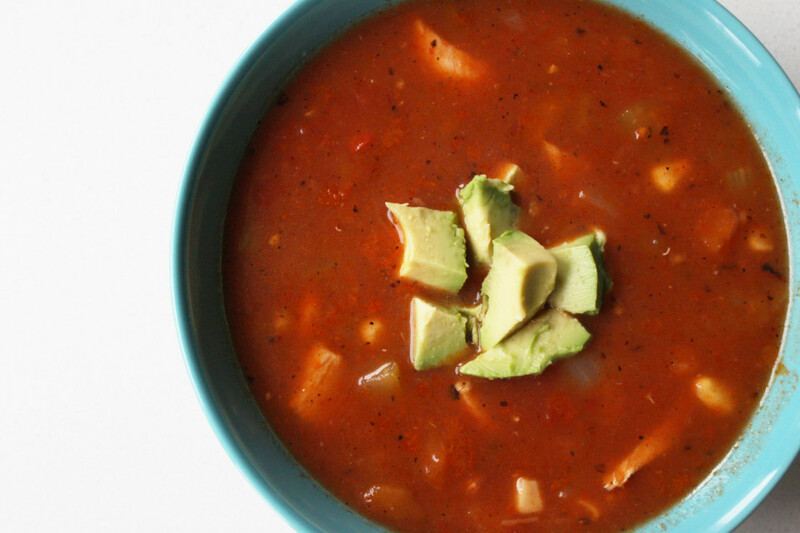 Once your chicken is done cooking, add all of your veggies and beans to the broth. Stir in the pureed tomato mixture. Bring to a boil, then reduce to a simmer and cook for about 20 minutes, or until all of the veggies are tender. Enjoy with sliced avocado, cheese (if you can have it) and some crispy tortilla chips.